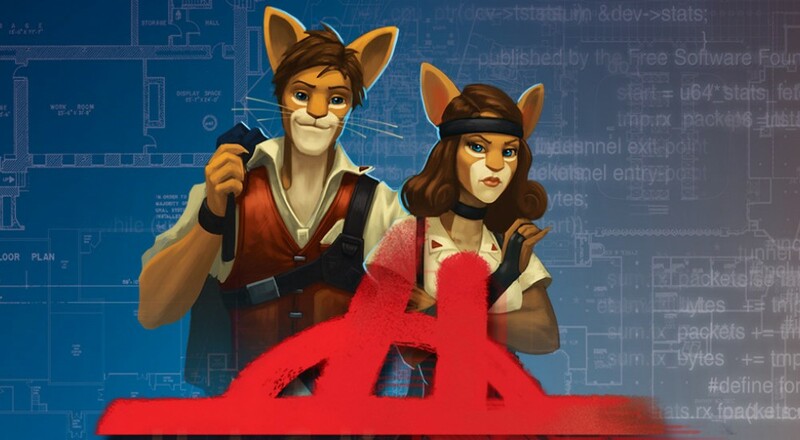 At PAX East last weekend, I went hands-on with asymmetrical stealth co-op game Hacktag. Created by Piece of Cake Studios (a studio completely dedicated to making co-op games and composed of industry vets), Hacktag impressed. My time with the game left me wanting to play and improve more. Hacktag is a 2-player cooperative game where one player takes on the role of the agent and the other takes on the role of the hacker. The game is set up to tell the story of these two mercenaries as they stick it to the man, stealing valuable data from big-time corporations. There are three separate campaigns with each campaign focused on one of three corporations. These campaigns each provide 4-6 hours of gameplay while telling a comprehensive story of the different corporations. The campaigns are each divided into multiple procedurally-generated missions, for maximum replayability. 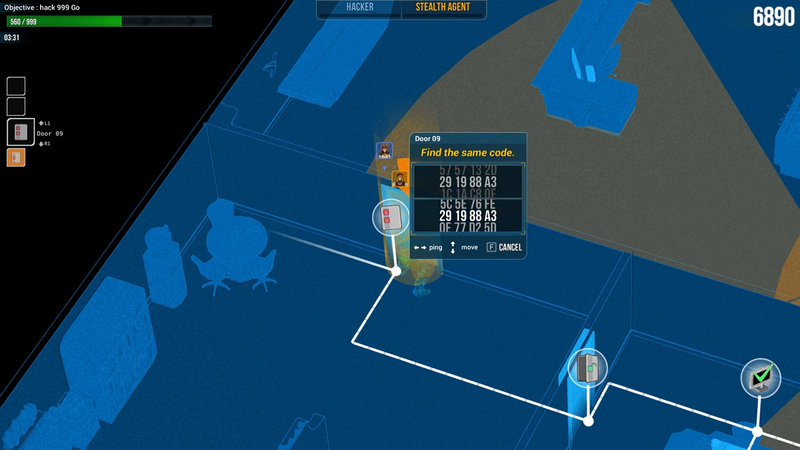 Missions will be one of three types: data scavenge, sabotage, and file retrieval. In each of them, the agent will be sneaking around a building, trying to evade guards and alarms. The hacker will be in a virtual world that has the same layout as the real world, though with different possible routes and passageways. She has her own virtual guards and alarms to evade as well. The two mercenaries must support each other by opening doors/data ports for the other so they can proceed throughout the level, all while avoiding various guards and alarms. To make matters even more complicated, opening doors/data ports isn’t as simple as just pushing a button; there’s generally some kind of mini-game involved. There are even times when both players must interact with the same terminal at the same time to progress. This really puts the pressure on the players, just like a good heist/stealth game should! For the demo at PAX East, my friend and I played a data scavenge mission a few times. We found the game to be extremely challenging, but in a way that pushed us to get better and play smarter, not in a way that was overly frustrating. When a physical or virtual guard catches one of the mercenaries, it’s not simply game over. 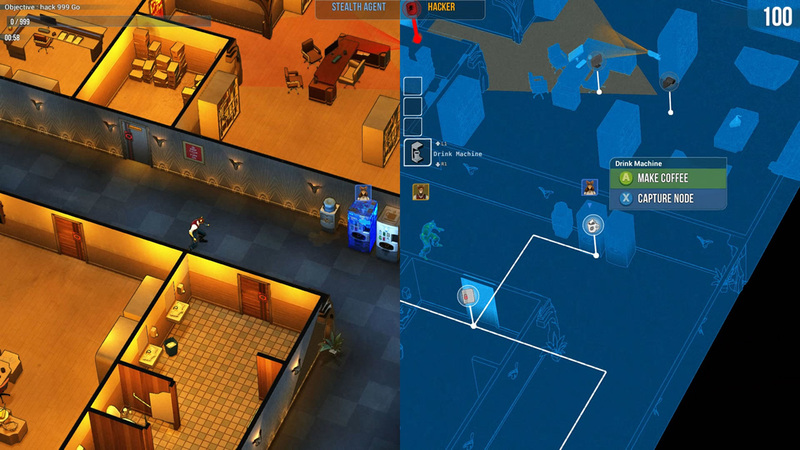 The character is escorted to a designated cell in the level and the other player has a set amount of time to free him or her. Being caught detracts points for your score and resets some things like alarms and doors, so you certainly want to avoid it if you can. 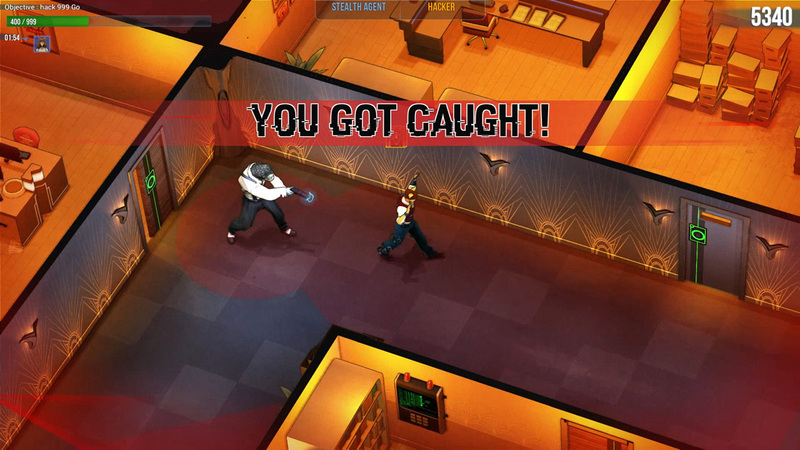 If both characters are caught at the same time, then the mission ends in failure. In addition to the immersive atmosphere, I found one of the game’s greatest strengths to be how it promoted strong communication between players. It would’ve been impossible to get very far at all without talking to my fellow player to coordinate our efforts. Pulling off a tightly-timed maneuver always felt like a license to celebrate together, which was awesome. This is, after all, why many of us play cooperative games: to have a great time while feeling like we’re stronger together than apart. I also had a lot of time to chat with Co-founder and CMO Bérenger Dupré. We chatted about some of the features that either weren’t present in the demo or that I didn’t get a chance to see, like the character progression system. After the end of a mission, players will earn XP (even gaining some XP when they lose the mission) which in turn will lead to leveling up and unlocking skills. These skills can be equipped on a mission-by-mission basis: each character can choose 2 passive and 1 active skill to bring. This adds some customizability to approaching missions as well as further increasing the variability of gameplay. There will also be online challenges, rankings, and leaderboards. Hacktag was successfully Greenlit on Steam last week. It’s planned to release Summer 2017 on PC (supporting both online and local co-op) with PS4 and Xbox One releases planned sometime after that. It’s definitely a game I’ll be keeping my eye on.